Would You Consider A Wedding Band Upgrade? Home » deBebians Fine Jewelry Blog » Would You Consider A Wedding Band Upgrade? 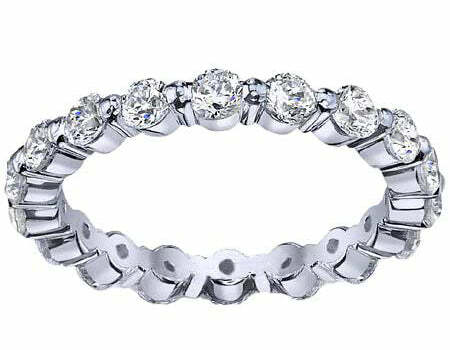 Many women are choosing to upgrade to an eternity wedding band on a special wedding anniversary. More and more women are getting married with the intention of eventually purchasing a wedding band upgrade and replacing their wedding bands. Their wedding bands are seen as something that can be traded in for something different in order to appease their changing lifestyle. Do you think your wedding band should evolve as your relationship does? Would you upgrade your wedding ring for something with more sparkle? If you purchase a plain wedding band when you were first married to save on money, but always craved something with a little more oomph, you are not alone. Many women are receiving upgraded wedding bands on special wedding anniversaries. An eternity wedding band is the most popular option because one of these rings features diamonds the entire way around the ring. For this reason, an eternity engagement ring is a symbol of everlasting love. What do you think of this growing trend? Would you ever upgrade your wedding band? deBebians has GIA graduate gemologists available if you need assistance in finding a new wedding band setting or if you would like to know how to find diamonds. Please contact us at your convenience for assistance.